The Citroen C-Zero is winning orders from green companies. GENEVA -- Citroen says demand for its electric vehicles is being boosted by companies seeking environmentally friendly transport. The French brand expects to sell 4,000 EVs this year, Xavier Duchemin, the brand's spokesman for EVs, said. Duchemin said Citroen is "very confident" that the target will be reached because the brand has 2,000 customer orders for its EVs so far this year. He said 1,500 of those orders were for the CC-Zero electric minicar that went on sale at the end of December. The other 500 were for an electric version of its Berlingo car-derived van that will arrive in showrooms mid-March. Duchemin said Citroen aims to sell 10,000 EVs next year. Sister brand Peugeot is forecasting a similar EV volume, he said. Companies such as the French postal service, the German railway network and General Electric are among major customers for Citroen's EVs, which have no CO2 emissions and so are considered more environmentally friendly than gasoline or diesel vehicles. "Companies are buying our EVs because they want to be green," Duchemin told Automotive News Europe at the Geneva auto show last week. Citroen is not worried that its EV sales will suffer after the ending of incentives of up to 5,000 euros currently offered in many European countries. Duchemin said drivers of electric cars benefit from "indirect" subsidies. For instance, in London electric car drivers are exempt form the city's 10 pounds a day congestion charge. In other European cities such as Paris that may limit or ban cars on certain days to cut pollution, EVs likely will be exempt. 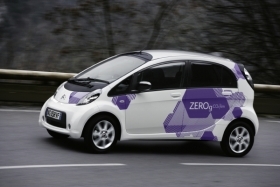 The four-seat C-Zero and its sister model, the Peugeot iOn, are based on the Mitsubishi i-MiEV. While rival Renault SA and its alliance partner, Nissan Motor Co., aim to become the mass market leaders in EVs by developing and launching a wide range of EVs, PSA/Peugeot-Citroen SA has outsourced much of its EV development so that it can concentrate in-house resources on hybrids, which the company says will be a much more important market for low-emission vehicles than full-electric cars. But, said Duchemin, "We are still ahead of our competitors because we have electric cars on the road now."